Posted by Andrew Whyman under Technology, on 20 February 2013 @ 10:41pm. If you read my last blog about my UPS battery woes and it interested you, then this one might help you further. Batteries are a horrible technology in many respects. They’re expensive, damaging to the environment and incredibly inefficient. Unfortunately we have nothing better so we have to make do until another technology is found. While not the best at energy storage compared to Lithium Ion/Polymer, they are much cheaper and store close to the same amount of energy too. Taking care of these batteries is important (as with any battery actually) because of the way in which they work. 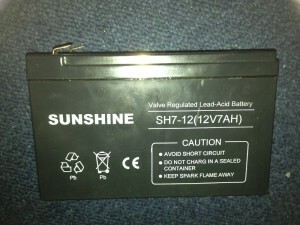 A lead acid battery is comprised of lead plates and an electrolyte solution of sulfuric acid. This is how the battery holds it’s energy. During normal use, the energy will be released and stored via a chemical reaction. This reaction heats the electrolyte and over time this solution evaporates. If this happens too much and the lead plates become exposed and/or dry, the capacity of the battery will drop. Generally “going dry” is what kills a lot of mis-used batteries. But this isn’t all, there is also another process called “sulphation”. This occurs when the battery is discharged and sulphur builds up on the lead plates. This inhibits it’s ability to hold and release energy. This also kills batteries when mis-used, especially when left discharged. This is common in cars and other vehicles, especially in winter when the battery is put under more strain. Now the problem I had was mainly the cells going dry through what is known as “float charging”. This is when the battery is held at a voltage above it’s natural storage voltage to keep the charge level at 100%. This is constantly putting some energy into the battery so it warms up, and the electrolyte dries off. This is what killed my UPS batteries, because the UPS was in essence over-charging the battery. How can this be avoided? Don’t keep it on float of course, or if you do, do it at a reduced voltage. My Belkin UPS’s keep a float charge of about 13.3-13.6v. A standard 12v battery will sit at about 12.8-13.3v when fully charged, so if you can keep it around that voltage, you should extend the life of the battery. However, if you don’t bring a 12v battery up to 14.0-14.5v when charging, it will never fully charge and so you will end up sulphating the plates quicker. It’s a tricky situation, but it can be avoided. Bulk phase – Charging the battery at a constant current (generally 10-30% of the battery capacity, referred to as “C”). For example, 10Ah battery holds 10,000mAh of capacity, so you would charge it at 1000-3000mA or 1-3A. Absorption phase – Charging the battery at constant voltage (typically 14.0-14.5v for a 12v battery) until the current drops to about 1% of C. For a 10Ah battery this would be 100mA or 0.1A. Trickle phase – Holding the battery at a reduced constant voltage (the tricky part is what voltage to use here). 2 stage charging is the same as above but without the trickle charge phase. My Belkin UPS appears to do 3 stage charging, and it’s trickle voltage is around 13.3-13.6v. The difference with mine is it’s not constant voltage but rather it pulses on and off. Pulsing has been tested but there is no definitive proof it helps over the long run. The better way to do this would be to do 2 stage charging, then cut off the charging completely until the voltage drops below a set level. Then you begin the process over again. This is the better way as it lets the battery rest with full capacity, without charging to make the electrolyte evaporate off. I don’t know why more systems don’t do this. I imagine it’s for simplicity in design, otherwise they would need to incorporate a fully battery monitoring system which would cost more money. Who knows, but it makes sense to cut it off after it’s charged. This is especially important for lithium batteries like those in mobile phones. If you over-charge these (continue to charge when full), they can explode! So why do it with lead acids of any kind? Now that you know about charging, what about safe discharge levels? This is one that has plagued many people. Generally voltage would be used, wouldn’t you think? Well no, because lead acid batteries charge/discharge level cannot be determined without use of a hydrometer. This is a device that you use to sample the electrolyte from the battery and uses floats to determine the “specific gravity” of the electrolyte. I won’t go into how this works, but it’s something you can only do manually. Voltage on any battery is not a charge level indicator, you can only use it as a dummy guide and it will often fail you. That said, you should be aware of safe limits that lead acid batteries work to. Here is a handy table to explain it to you. As a general rule, the battery should never be discharged past 12v when “resting”. Resting means it has been sat for more than 4 hours with zero load connected to it. With a load connected, you should never discharge below 10.5v. If you continue to discharge it, you risk warping the lead plates, and doing so can create a short circuit which will ruin your battery.This is a very basic table of charge level based on voltage and what the specific gravity is expected to be. Going in the standard good to bad colours, you can see that the battery capacity is only good above 50%. This is because below this, sulphation occurs much more quickly. On a totally flat battery this can be as quickly as a day or two. You should also ALWAYS charge a lead acid battery after it has been used. Even if it was just a few percent, because any discharge speeds up plate sulphation. This is something I didn’t take into account when building my camping power box. My LED volt meter range goes from 10.7v to 12.5v when really it should have been 12.0 to 12.6v. However, that said, now that I know it’s wrong I can use my own knowledge to determine when to stop using it and recharge it. The added range allows me to see when it’s time to stop using it under load as well. Hopefully you have learned something from this and it’s a reminder for me if nothing else. Posted by Andrew Whyman under Servers, on 20 February 2013 @ 9:59pm. For those of you who don’t know what a UPS is, it’s an uninterruptable power supply, or “battery backup” for your PC/servers and other electrical items which takes over when the mains fails. I have a couple of them, one for my PC, one for my server and one for my network equipment. Recently, the batteries in one of those UPS’s decided they didn’t want to play anymore and suffered catastrophic failure. 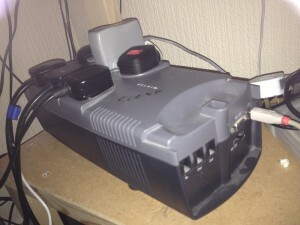 This meant that the UPS would no longer hold if the mains power dropped. Typically the batteries should last about 3-5 years but these only lasted a tad over 2 years. I was disappointed but then I began reading why this varies between UPS’s. for the PC itself. I have it this way because my PC is fairly high end so it can reach a fairly high power usage when being used heavily. A single UPS for all of this was unlikely to hold very long. These UPS’s are about 5 years old and still had their original batteries. I had known for some time these were getting poor but it wasn’t until now I decided to replace them with new ones. I have retired the UPS that had batteries die recently and took the monitors UPS and put that on my server instead. The remaining UPS for my PC now holds one of my monitors and the PC only. I began to think why these batteries lasted 5 years and still had life in them but these others lasted just 2. I discovered that the “float” voltage, the voltage that the battery is held at once fully charged was likely too high on the UPS that recently died. It tended to hold it at 13.8v. A fully charged 12v battery sits at about 12.8-13.3v. These other UPS’s seem to pulse the power into the battery at around 13.3-13.6v rather than holding it at 13.8v. This is likely the explanation to their longer life, so it makes sense to stop using the other one and use these instead. This discovered I decided to buy 2 new batteries, one for each UPS. I did my best to select the best brand I could because I read that they tend to last longer as well. However when these batteries arrived they were not the brand I had thought I ordered. Despite this I tried them in my UPS’s anyway and immediately had a problem. Firstly, I checked the weight of them against the old ones. They were 0.5KG lighter which suggests a lower lead density and thus a lower energy density as well. This was worrying because I opted for the “best brand” available. Although when I got the batteries they were not fully charged, I would have expected them to put out enough power to at least keep the PC’s online and/or boot them up. During testing they would switch to batteries just fine, but they would not start the PC from cold (powered off). This isn’t how a UPS is supposed to work, it should work both ways. During testing these batteries reached 2 minutes of sustained run time before encountering a low battery condition and shutting off. This wasn’t acceptable. The original batteries would have held the load for at least 10-15 minutes!ble. Despite that I carried on with testing. Unhappy with this I thought I’d let them charge for 24-48 hours and see how that goes. I then tried the test again and managed around the same sustained run time. I contacted the seller on eBay that I got them from and explained I wasn’t happy. He replied saying that they are likely being trickle charged and it could take up to 3-4 days to fully charge them. The specs say 8 hours to fully charge, but they could be wrong. He assured me they were the one of the best brands and suggested I try them again in 3-4 days. He also said the weight difference should offer little difference to their output. 3-4 days later I tried another test and managed 12 and 14 minutes between them. This was significantly better but not quite what I expected. I contacted the seller again who said it might take a couple of charge/discharge cycles to get them to 100%. I agreed as batteries do sometimes need this cycling so I said I would try again in a few more days. It’s only been 2 so I haven’t tested them yet, but I am hopeful that they will be slightly better again. All in all it’s been a bit of a pain but it was also a learning curve involving a fair amount of research. This leads me on to my next blog about battery knowledge, as I have learned a few things I didn’t know about how to care for batteries recently. Posted by Andrew Whyman under Life, Rants, on 16 February 2013 @ 11:34pm. It occurred to me a few days ago that this issue with my car has been going on for almost 10 months now, and that I will have owned the car 1 year in around 1 month from this post… How you’re probably wondering, has this not been resolved yet? The answer is time wasting by several parties. I originally opted to reject the car 4-5 months after purchase when I found out I had the right to do so under the sales of goods act. From that point, everything has been slow. The finance company admittedly were fairly quick, organising the report within 2 weeks, but their report took a further 2 weeks to come through and was ultimately pointless because the finance company said no to my rejection request. I then went to the finance ombudsman and this took weeks to even get rolling. Every time they contacted the finance company it was at least a week before they got a reply from them. When they did finally get the reply it was up to me to wait for the ombudsman’s decision. They kept asking for more details, which is good, because I want them to know the whole story. But the information they had was, in my opinion, more than enough to conclude in my favour (though I would say that, but you should see the evidence for yourself). So here we are months later and I think we’re finally getting somewhere, and then they ask for another report to be done on the car. In my eyes this will prove nothing because what they want to know is the faults that existed at purchase, but all they can prove now with this test is what faults it has now. In any case, they won’t proceed without it so I have no choice. Thankfully for me, they’re making the finance company pay for it. That brings me to yet more set backs. I contacted my local garage who got back to me quickly saying they couldn’t help. Fair enough, it was worth a try. They directed me to a local company who could do the reports so I got in touch. That’s where more problems started. They were far from professional. I had to keep chasing e-mails because they weren’t replying, I had to call them to give more details only to be told “oh, well, I’m not sure we can help, let me review the information again…” etc. 3 weeks down the line I’m growing impatient and my last 2 e-mails have gone ignored for over a week. I sent one last e-mail asking them to make a decision or I would go elsewhere. Later that day they said they’d spoken to their MD and they were not able to help me. 3 weeks to be told they couldn’t help me!!! Gah!!! So now I have to find another local company I did a search and quickly found one. They are just down the road from where I work making it ideal. I sent them an e-mail and an hour later they said they were able to help me. I sent all the information I had and they said they were definitely able to help as they deal with such things all the time. Fantastic! I’ve got a quote off them and it’s been forwarded to the ombudsman who will forward it to the finance company next week for approval. Once I have their approval I can finally get it booked and done. At this rate I might actually have a decision by the end of the month or early March. Fingers crossed!